On the basis of a unique global comparison of data from core samples extracted from the ocean floor and the polar ice sheets, AWI researchers have now demonstrated that, though climate change has decreased around the globe from glacial to interglacial periods, the difference is by no means as pronounced as previously assumed. Until now, it was believed that glacial periods were characterised by extreme temperature variability, while interglacial periods were relatively stable. The researchers published their findings in the journal Nature. If you want to know how the climate will change in the future, you need to look at the past. By looking at the climate changes that took place thousands of years ago, we can improve predictions for future climate. Comparing layers in ice-core samples and ocean sediments has allowed researchers to deduce how the average temperature on Earth has changed over time, and also how great the variability was. From the height of the last glacial period 21,000 years ago to our current interglacial period, the Earth has warmed by an average of 5 degrees Celsius. In view of future global warming, it's vital for today's global population to know whether temperatures will rise steadily, or whether there will be sudden, major fluctuations. The frequency of extreme events represents an essential benchmark for climate change adaptation measures, since, when it comes to flood protection, transport and building materials, we need to be prepared for the worst-case scenario, and not just for "average" changes. Climate researchers from the Helmholtz Young Investigators Group ECUS at the Alfred Wegener Institute Helmholtz Centre for Polar and Marine Research (AWI) in Potsdam have now investigated how temperature variability changed as the Earth warmed from the last glacial period to the current interglacial period. To date it has been assumed that temperatures varied greatly during the last glacial, while the current interglacial was largely characterised by small temperature variations. This interpretation was based on water isotope data from central Greenland ice cores. The team, led by Dr Kira Rehfeld and Dr Thomas Laepple, compared the Greenland data with that from sediments collected in several ocean regions around the globe, as well as from ice-core samples gathered in the Antarctic. They demonstrate that the phenomenon of major temperature fluctuations during glacial periods has by no means manifested uniformly worldwide, but has instead varied from region to region. For instance, in the tropics, the temperature variations were three times as intense as today at the height of the last glacial, whereas the ice cores from Greenland indicate variations that were 70 times as intense. "The ice cores from Greenland are, without a doubt, an important key to understanding the climate of the past. That being said, our study confirms that the conclusions regarding Greenland aren't always representative of the entire world," explains Young Investigators Group leader Laepple, who also heads the ERC-funded Young Investigators Group SPACE. First author Kira Rehfeld and her colleagues have, for the first time, gathered and compared data from diverse climate archives and a total of 99 research sites. In the climate research community, ice cores are generally considered the gold standard, because their layers are highly consistent, unlike sediment layers from the seafloor, which are frequently marred by tectonic shifts, currents or marine organisms. The AWI researchers have devised mathematical methods that allow them to estimate the uncertainties and potential sources of error while assessing various paleoclimate archives, and to take these factors into account in their analyses. "As such, we can compare the sediment samples with the ice cores for various epochs in the planet's history," says Laepple. The more intensive variations during glacial periods are due to the greater difference in temperature between the ice-covered polar regions and the Tropics, which produced a more dynamic exchange of warm and cold air masses. "If we then follow that idea to its logical conclusion, it tells us the variations will continue to lessen as global warming progresses," says Rehfeld - simply because the difference in temperature between the warming North and the Tropics will decline. "However, our data covers timeframes spanning centuries and millennia - we can't zoom in on just a handful of years, which means we can only draw indirect conclusions regarding the extreme events that shape weather," explains climate researcher Rehfeld, who is currently pursuing research with the British Antarctic Survey (BAS). Climate modellers had previously postulated the mechanism of reduced variability under warmer climatic conditions in 2014. Yet with their analysis, Rehfeld, Laepple and colleagues are the first to reinforce this theory with global climate data from the past. 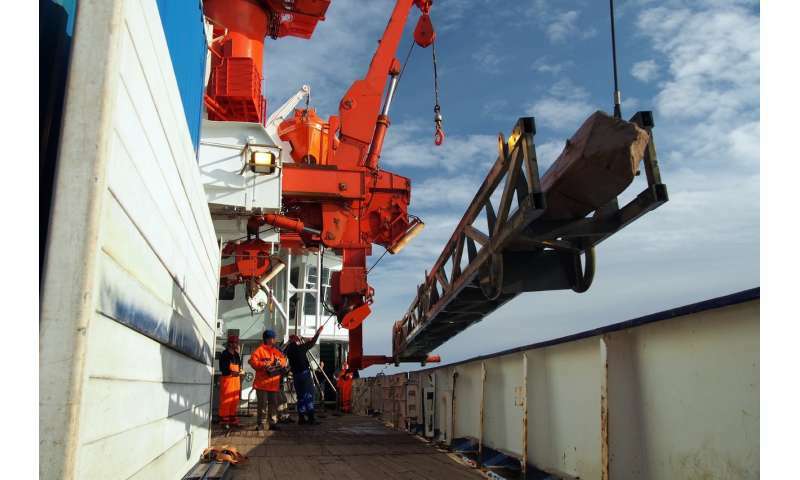 The AWI researchers describe their next endeavour as follows: "We plan to investigate in detail the changes in short-term variations in the past and their relation to long-term climate changes. To do so, we need reliable climate archives, and to improve our understanding of how they work." Increasing the accuracy to a level at which paleo-archives can also reflect extreme events will likely be one of the greatest challenges for the years to come. How variable are ocean temperatures?